The Galileo mission consists of two spacecraft: an orbiter and an atmospheric probe. Launched during the STS 34 flight of the Atlantis orbiter, the two spacecraft were kicked out of Earth orbit by an inertial upper stage (IUS) rocket, sending them careening through the inner solar system. The trajectory which the spacecraft followed was called a VEEGA (Venus-Earth-Earth Gravity Assist), traveling first in toward the Sun for a gravity assist from Venus before encountering the Earth two times (spaced two years apart). These encounters with Venus and the Earth allowed Galileo to gain enough velocity to get it out to Jupiter. During the flybys of Venus and the Earth, Galileo scientists took the opportunity to study these two planets as well as the Moon, making some unprecedented observations as a result. In addition, following each Earth flyby, Galileo made excursions as far out in the solar system as the asteroid belt, enabling scientists to make the first close-up studies of two asteroids, Gaspra and Ida. As is this were not sufficient, Galileo scientists were fortunate to be the only ones with a direct view of the Comet Shoemaker-Levy 9 fragment impacts on Jupiter. All of this was prior to the primary missions of sending an atmospheric probe into Jupiter's atmosphere and studying Jupiter, its satellites, and its magnetosphere for two years with the orbiter. 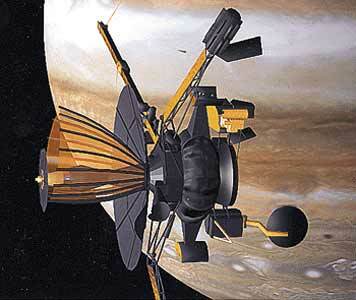 The probe was released from the orbiter 147 days prior to its entry into the Jovian atmosphere on 7 December 1995.
characterize the vector magnetic field and the energy spectra, composition, and angular distribution of energetic particles and plasma to a distance of 150 Rj. measure the flux of energetic charged particles down to the top of the atmosphere. 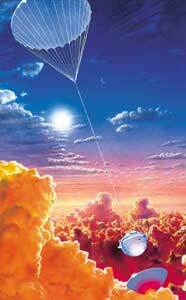 Galileo was deorbited at the end on the mission to avoid contaminating the moon Europa. It burned up in the Jupter atmosphere on 21 September 2003.